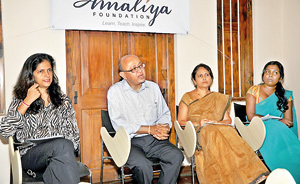 The Amaliya Early Learning Centre is an early intervention center for hearing impaired infants and young children up to five years of age was re-launched recently. It is a non-residential, private and non-profit organisation located at No.18, R. A. De Mel Mawatha, and Colombo 5 and provides an opportunity for deaf children to learn to listen and develop speech with our comprehensive intervention program. Principal Nisha Amalean who has years of experience in dealing with hearing impaired people explained that early intervention is crucial for hearing impaired children if they are to master speech and language. “Our goal is to help the children make best use of their residual hearing through the constant use of suitable hearing aids or cochlear implants and develop age appropriate languages skills. The curriculum prepares each child to enroll in a regular school at the earliest possible age. They will do so as soon as they demonstrate the skills necessary for competing successfully in a regular school environment,” she said. Parents too are equal partners with the teachers at the Centre in fostering the child’s progress. Therefore, one parent must attend class along with the child,” she said.